You will be given a Free reference e-book to read which has 504 pages And the test will be based on that e-book. The Windows server 2003 network infrastructure implementation, management and maintenance certification test is a kind of certification which works by certifying the skills, expertise and comprehensive knowledge of those who are in charge in expertly implementing, managing and maintaining the network infrastructure of Windows server 2003. Note that passing this test requires extreme familiarity on all the concepts, terms and aspects relevant to the field. The certification exam usually covers the basics of implementing, maintaining and managing IP addressing, managing DHCP leases and clients, relay agents, databases and scope options, diagnosing and resolving issues related to APIPA which stands for automatic private IP addressing, verifying DHCP reservation configuration, implementing, maintaining and managing name resolution and configuring DNS server and zone options and DNS forwarding. It also requires you to learn more about DNS management including its zone and record settings and server options, implementing, maintaining and managing network security and installing and configuring software update infrastructure. 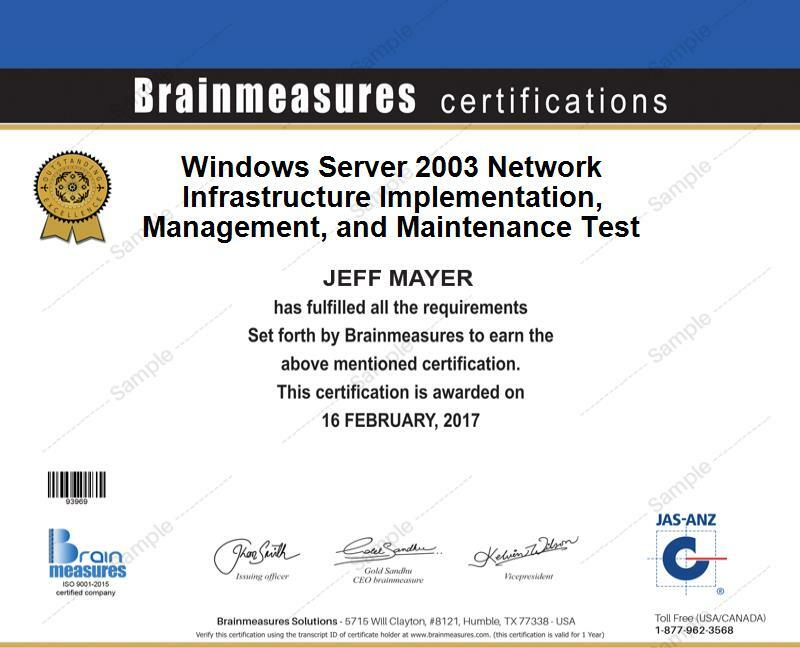 Fortunately, Brainmeasures is now around which offers a free Windows server 2003 network infrastructure implementation, management and maintenance practice course to everyone who is interested. The extensiveness of its free self study guide is useful in learning everything about passing the Windows server 2003 network infrastructure implementation, management and maintenance test while its free practice test is primarily designed to help improve your familiarity regarding the actual certification exam environment. The free Windows server 2003 network infrastructure implementation, management and maintenance practice course offered by Brainmeasures is your key towards receiving your desired certificate in this field. As one of the most impressive and the leading online certification provider, you have an assurance that this specific free practice course from Brainmeasures can assist you in taking and passing the Windows server 2003 network infrastructure implementation, management and maintenance test. Its free self study guide is one of its more recognizable and impressive features since it is really effective in supplying the participants of the course with accurate information about how to implement, manage and maintain the network infrastructure for Windows server 2003. Its free practice test is also crucial in generating a more complete understanding about how the actual certification exam runs. This will enable you to make all the preparations that you need to receive a passing percentage. Deciding to enrol in the free Windows server 2003 network infrastructure implementation, management and maintenance practice course from Brainmeasures can actually do a lot of good for numerous individuals and professionals. One can actually expect it to offer more benefits to those who dream of taking and passing the Windows Server 2003 network infrastructure implementation, management and maintenance certification test and easily show their expertise and competence in this specific field. You will also enjoy the usefulness of your earned Windows server 2003 network infrastructure implementation, management and maintenance certification in increasing your present income. With the help of your received certificate, you can work as a Windows server 2003 network administrator and enjoy average annual earnings of $76,000. You can also work as a Windows 2003 network infrastructure implementation consultant which offers around $56,000 to $121,000 yearly.